Sara Collie, left, Carly Franklin, Jim Coleman, Tracey Barnett and Kim Stauss. School of Social Work in the J. William Fulbright College of Arts and Sciences received this year’s Daniel E.& Ferritor Award for Departmental Excellence in Teaching at the University of Arkansas, recognizing the department’s collaboration, dedication to its students and commitment to the local community. The accolade includes a $10,000 one-time monetary award to the department’s budget as well as a trophy. The department was also formally recognized at an April 11 reception as part of Faculty Appreciation Week. The award was determined based on criteria including the department’s commitment to excellence in teaching and learning, faculty development and student success. Specifically, the committee noted the department’s focus on its students, engagement efforts with local nonprofits and continuous efforts toward self-improvement. The program’s quality is also evidenced in its graduates having the highest pass rate among universities in Arkansas for the social work licensing exam. For Kim, chair of the School of Social Work, the award is a confirmation of the department’s work. Alishia Ferguson, director of the school, cited their designation as a professional degree program and its emphasis on teaching practical concepts. Even after winning the award, Stauss said the school is still looking toward the future and how they can better serve their students. The accolade, which is given by the Office of the Provost and the Teaching Academy, was voted upon by a committee comprised of four members of the academy and three faculty appointed by the provost. 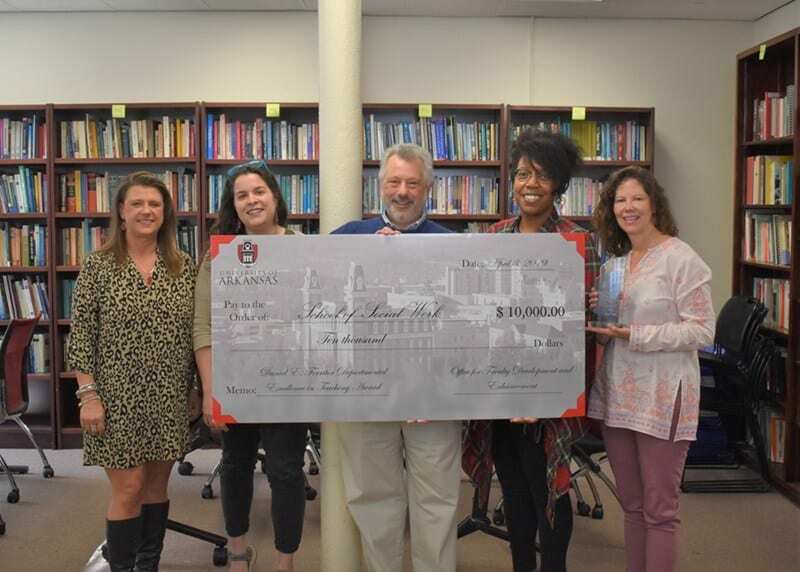 The award is named in honor of former U of A Chancellor Daniel E. Ferritor in recognition of his longstanding commitment to students and faculty and his consistent support for excellence in teaching and learning at the University of Arkansas. The Teaching Academy, which was organized by Ferritor in 1988 and co-sponsors the award with the Provost’s Office, seeks to advocate and represent teaching interests, promote and stimulate an environment of teaching and learning excellence, and encourage recognition and reward for exceptional teaching.